J.M. Helfgot Communications is dedicated to working with you at all levels of your communication growth, from helping you define communication objectives to achieving and surpassing those goals. Whatever your requirements, we can - and will - work with you. Based on your needs and the underlying objectives you hope to achieve - raising awareness, growing a consumer or client base, reaching out to new markets, alleviating a public relations stumble, learning how to better communicate your key messages to an audience, defining those messages and audiences, or any other communication objective - we will develop a plan of action and execute it. At J.M. 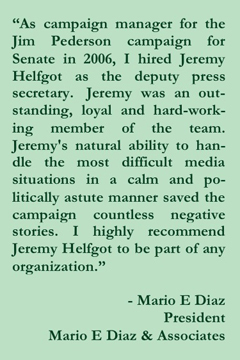 Helfgot Communications we are always looking forward to working with dynamic organizations like yours. We're eager to work with you to define and achieve your objectives, increase your visibility, navigate rough waters (or help you avoid them) and connect you with the resources you need to catapult your efforts to the next level. However we can help - with a full-blown communication strategy and campaign, or with individual services such as event planning and development or media training for your leadership and executives - we'll work with you to create a package that is right for your needs and your budget. You're doing great and unique things. It's time that the whole world knew about them. We're ready, available and enthusiastic to help.